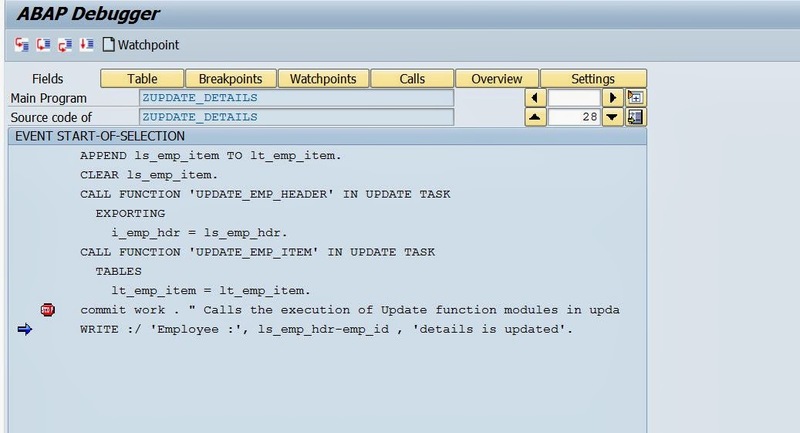 Scenario: This post describes how to use UPDATE FMs to achieve SAP LUW. This involves two data base tables. We want to achieve the below functionality. Either the two tables will be updated together or none of them. Step1. Create a header table with below fields. Step2. Create a item table with below fields. Step3. Write a Report program. Fill the Header work area and item table. 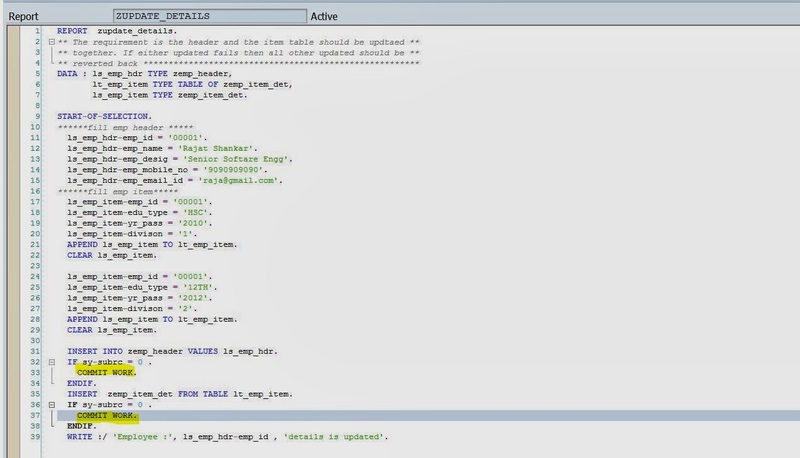 For the example here for a single header line we have multiple line items. The report doesn’t contain any Commit Work statement. After the program execution and database update Commit Work happens implicitly( By Default). 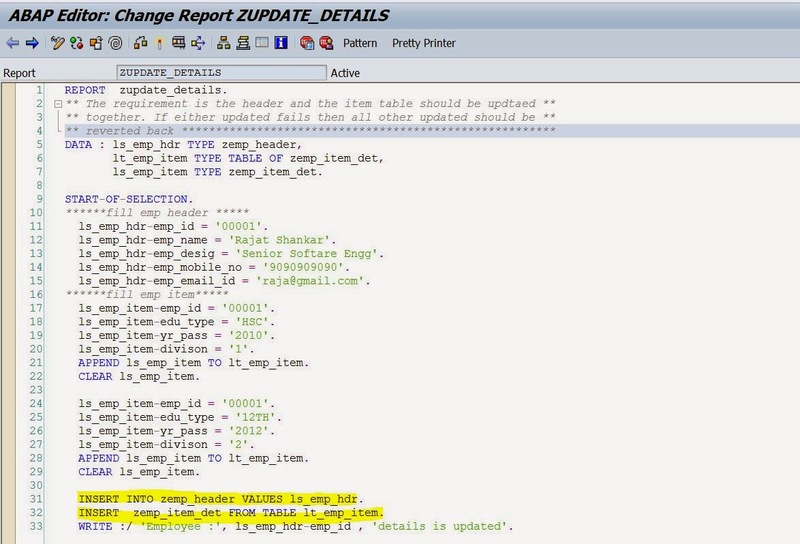 Or we can slightly change the report, so that we have COMMIT WORK statement for every database update statements to explicitly. ls_emp_hdr-emp_desig = ‘Senior Softare Engg’. INSERT INTO zemp_header VALUES ls_emp_hdr. INSERT zemp_item_det FROM TABLE lt_emp_item. 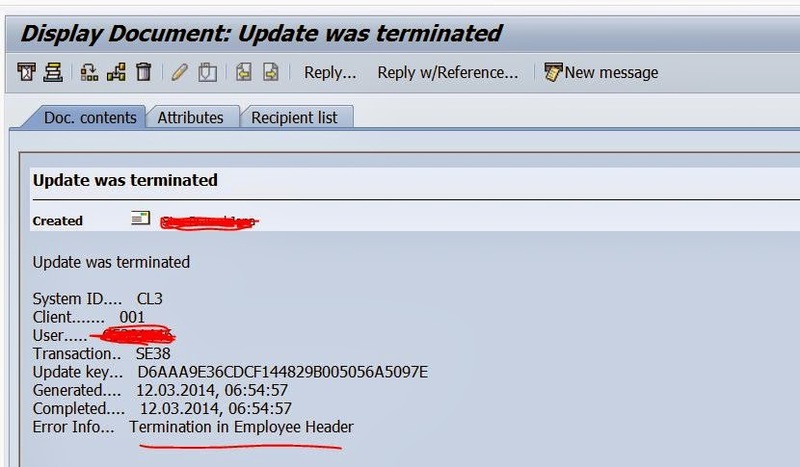 WRITE ‘Employee :’, ls_emp_hdr-emp_id , ‘details is updated’. Step4. Explicitly Specifying COMMIT WORK for each SQL Insert Statement. Step5. Execute the report and the below output appears. Step6. The header table is updated with one record. Step7. The item table is updated with 2 dependent records. In Case-1 both the data base tables are updated properly. So there is no data inconsistency. Before testing the CASE-2 delete all entries from the two data base tables, so that no need to change the data in the program. Step8. Slightly change the report. Put a rollback statement for the ITEM table update. This rollback we are doing manually to test our scenario but it might happen automatically . Execute the report. Step11. The Header table is updated properly. Step12. But the ITEM table is not updated with any records leading to data inconsistencies. Before testing the CASE-3 delete all entries from the two data base tables, so that no need to change the data in the program. Step13. 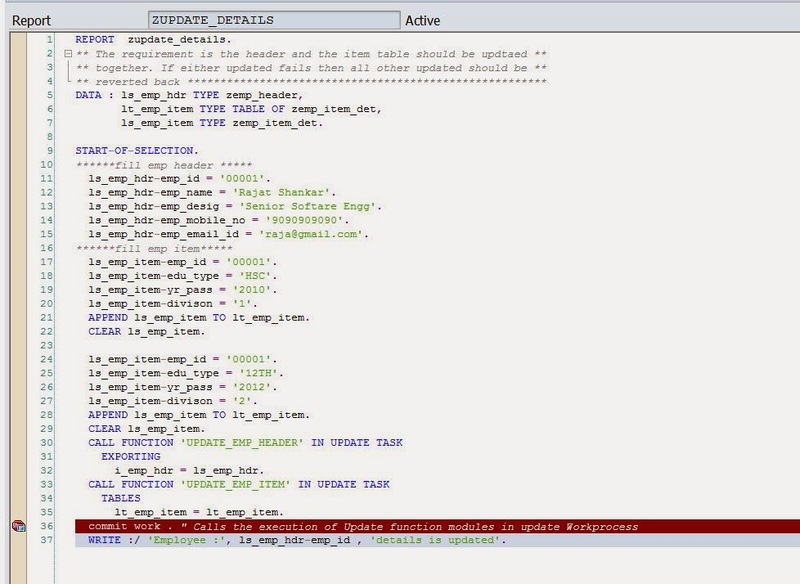 In this Case, Put a Rollback for the Header table and execute the report. Step16. The header table is not updated due to the rollback. Step17. The ITEM table is updated properly. Before testing the CASE-4 delete all entries from the two data base tables, so that no need to change the data in the program. Step18. Put ROLLBACK for both Header and Item. Step21. No records are updated in the Header table. Step22. No records are updated in the ITEM tale. there are some data inconsistencies like header contains the record but the dependent item doesn’t have any or the Item table contains the records and the header is empty. To over come this situation, lets use UPDATE FUNCTION MODULE to apply SAP LUW technique. Step23. 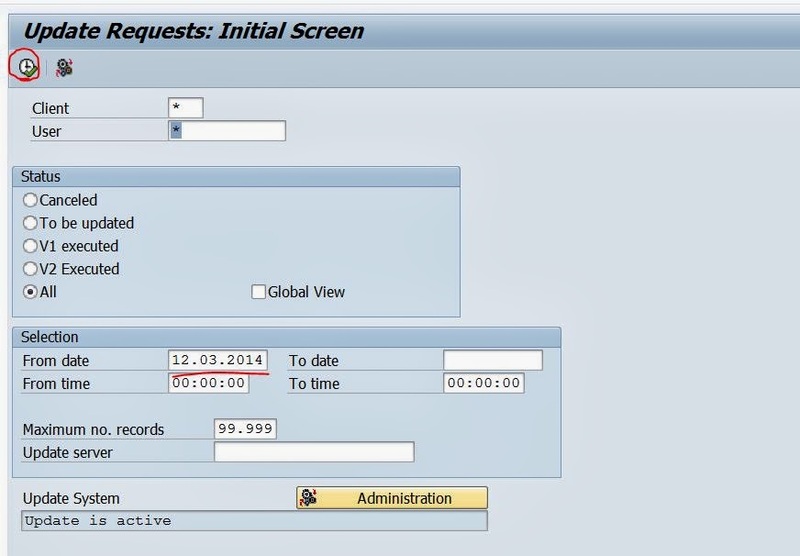 Create a Function group and create a FM. Step24. 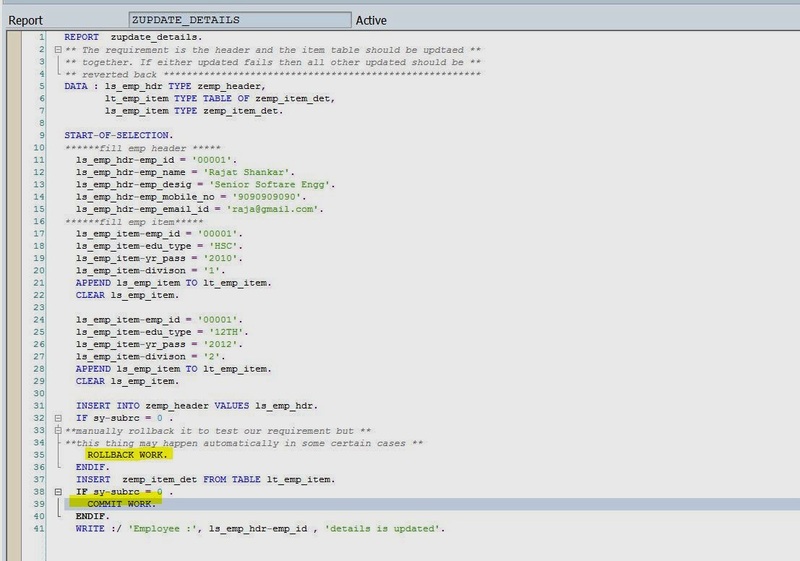 Provide the importing parameters. Step25. Provide below source code in the FM. Step26. Create another FM for the ITEM table update. Step28. Provide below source code in the FM. Before testing the CASE-5 delete all entries from the two data base tables, so that no need to change the data in the program. Step32. No records updated in the header table. Step33. No record updated in the ITEM TABLE. In the above CASE-5, the program executed successfully and call to the UPDATE FMs are made but the FM codes are not executed. The Update FMs source code executes when it found any COMMIT WORK statement in the program explicitly. Though Implicit Commit Work happens at the end of the program execution but UPDATE FM execution starts only when explicit commit work is mentioned in the program. Before testing the CASE-6 delete all entries from the two data base tables, so that no need to change the data in the program. Step34. This time put a explicit COMMIT WORK statement in the Program and also put DEBUG POINT at Commit Work statement. Step36. The debugger stops at this point. 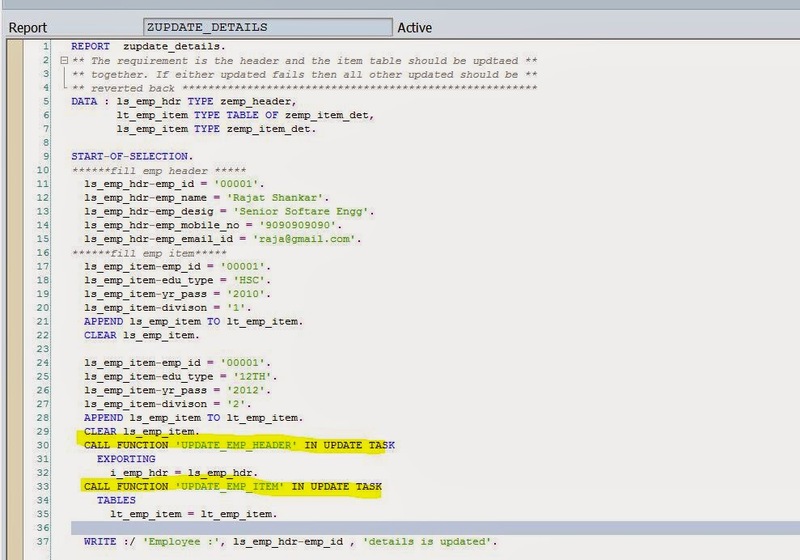 There are some DB tables that holds UPDATE FM call, data for temporary period of time. The tables are VBHDR, VBMOD & VBDATA. Step37. At this point header table is not updated. Step38. Also ITEM table is not updtaed. Step39. 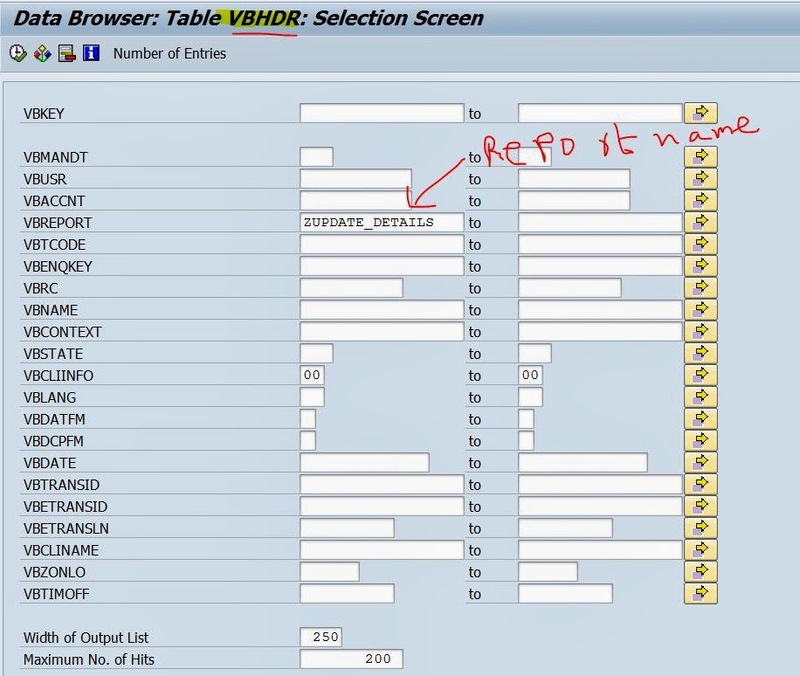 Go to VBHDR table and Provide Your Report name that uses Update FM calls. Step40. The contest are displayed. It contains VBKEY and the transaction name from where it is called (in this case -SE38). Step41. Go to the VBMOD table in SE11 and provide the update FM names . Step42. It also displays the VBKEY and the FM names . Step43. Go to VBDATA table and provide VBKEY values that we obtain from VBHDR or from VBMOD table. Step44. It displays the data lengths. Step45. Press F5 button to execute the commit work statement. Step46. The Header table is updated successfully. Step47. The ITEM table is also updated successfully. Before testing the CASE-7 delete all entries from the two data base tables, so that no need to change the data in the program. Step48. Go to the ITEM update FM and put some extra code. 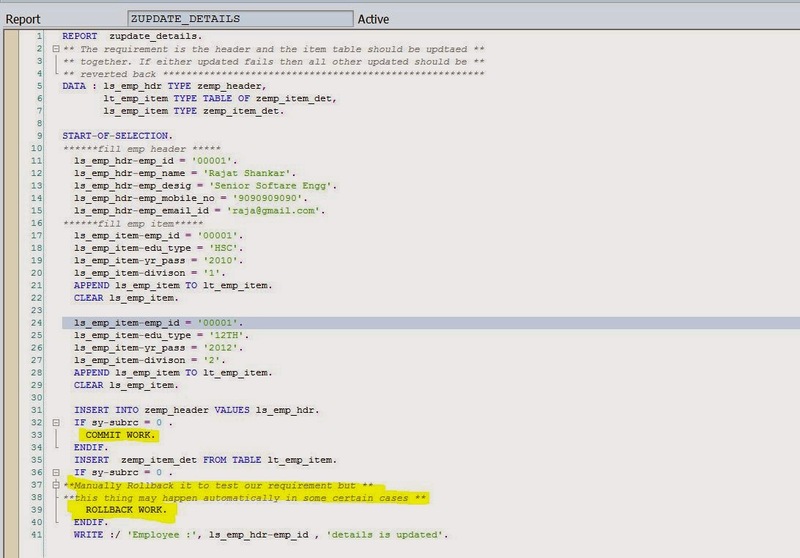 Put a Message type ‘A’ to fail the DATABASE update. Step49. The below output appears. Click on BACK button. Step50. The below screen appears saying that UPDATE FM Termination. Click on the INBOX button. Step51. Click on the first highlighted message in the INBOX section. Step52. It shows the details. The Message content that we have mentioned in the ITEM FM appears here. Step53. No header records are updated. Step54. No ITEM records are updated. 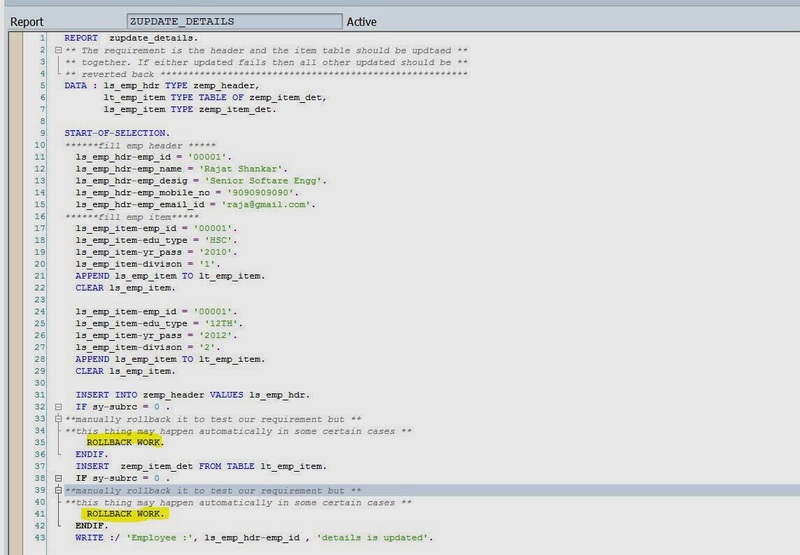 In this case the Header Update FM is called first and one record is inserted in the Header table and while calling the ITEM update FM, there is an error, so as both UPDATE FMs are combined into a single SAP LUW and the ITEM FM fails, the DB update made by the Header FM is also reverted back. Step55. To see the Update FM failure details, Use Tcode- SM13. Step57. Double click on the first Update Failure record in the ALV display. Before testing the CASE-8 delete all entries from the two data base tables, so that no need to change the data in the program. Step59. Put a Message type ‘A’ in the header Update FM. Step61. The below output appears. Click on back button. Step62. 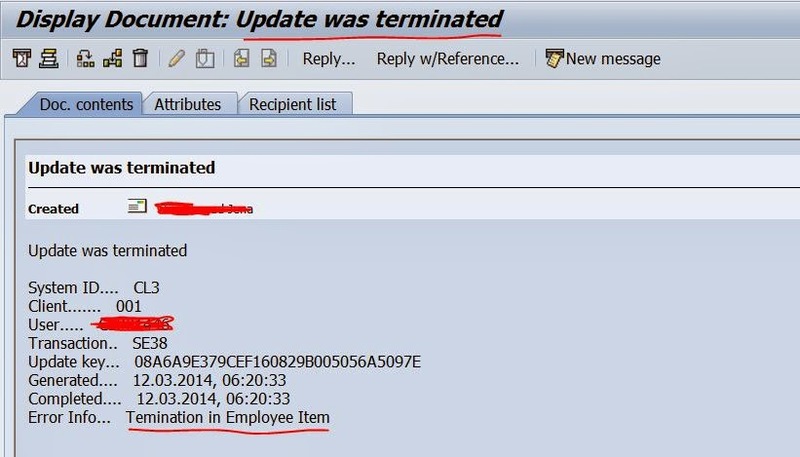 the below Update Termination message comes up. Click on the Inbox button. Step63. Click on the first message in the Inbox. Step64. Te details of the error message it shows. Step65. Go to SM13 and double click on the first line. Step66. It show the error in the Header Update FM. Also in this case, check the two database tables, none of the tables are updated. Appreciation : Bro, Your Way of teaching, is hats off, no one has cleared doubt and explain in such lucid and easy way…it shows ur love with Coding,.it shows how depth knowledge u carries…. keep it up with such article for us…. Doubt : how to set Update FM to run in V1, V2 and Local ?? ?